Sept. 5, 2013. As the oldest art store in Watauga County, Art Mart has created quite a following. A glance around Appalachian State University’s campus reveals students jostling bags of supplies and juggling canvases from the popular artistry destination. Students, professionals and aspiring artists will be excited to know that Art Mart has made a move on up to downtown Boone with its new location on King Street. The grand opening of Art Mart will coincide with downtown Boone’s famous First Friday Art Crawl, where the shop will offer wine, refreshments and of course, art! “The students seem happy that we have moved closer to campus,” said John Bond, who has owned Art Mart since 2000. Art Mart has always had a huge following in Watauga County. Walking into the new shop, little has changed about the store. The shop itself was downsized by about 1,200 feet, but the layout of the store is easier to navigate due to the shape of the space. Art classes are still being taught in the massive gallery and studio space located in the back of the store, and one can still find the familiar wagging tails of Bond’s dogs, Ziggy and DaVinci. “We have such a huge following because of our knowledge of product,” Bond said. Though the address is different, the phone number remains the same. The hours for the opening weeks are 9 a.m.-6 p.m. seven days a week. Stop by in the creative lounge space and read up on a few techniques. Talk to a staff member about a new product, or even for some creative inspiration. With the new location on King Street, creativity is just a short walk away. 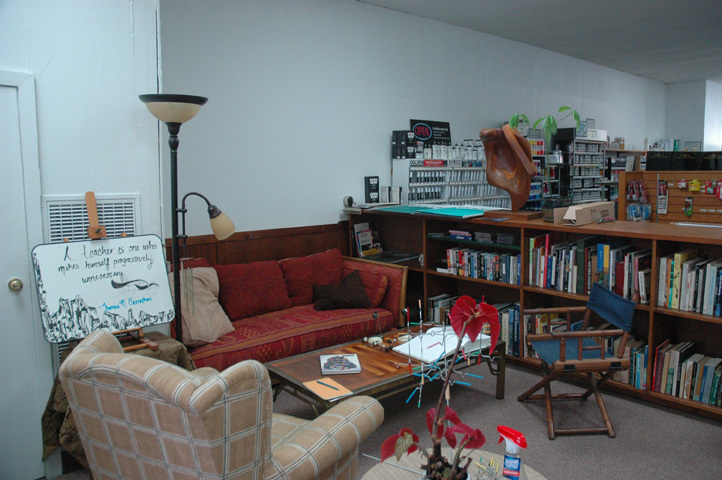 Art Mart’s creative lounge space.